Ok, if your information would be correct I would agree, however Socket F is due to H1/2006, i.e. the same 3-5 month timeframe we have to wait for Bensley. Thus Bentley is not competing with the tested S940 Sytem but with a Socket F System. Apart from that, I do not see your point about not being interested in Socket F at all. Of course, there is little information about it, but what it is sure is that it will be presented in 2006. Because new product generations are normally faster/better than the old ones (old tradition in the computer, if not any market ;-). I would be interested to know that. It is like saying the new Volkswagen is next year best car on the market, because it is better than the current competition, without mentioning that there will also be a new Toyota model. 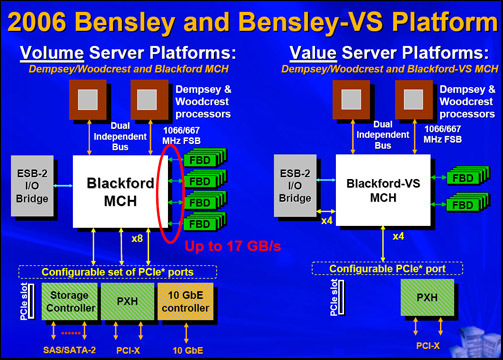 The first Intel dual core for dual core servers is out and the CPU is called Paxville. It uses the aging Lindenhurst chipset with single 800MHz FSB while Bensley will use dual 1066FSB. The highest clock for Paxville is 3.0GHz. It says Bensley with Dempsey will be out Q1 of 2006. 3.2 and 3.46GHz will be 1066FSB. 2.5, 2.83 and 3GHz will be 667FSB. MV versions will be 3.2GHz with 1066FSB. I dont mind that AMD has held the lead for quite some time bc they needed it badly. But it wasn't good that Intel had nothing that could compare. Now at least Intel is on the map again as AMD which might acctually force AMD to go a bit faster again. Then on the topic of power, if it is 8k, 20k or 50k you save per year by buying product A instead of B isn't important if everything else is equal. 8k is more then enough to rule in favour of AMD (remember everything else equal).